The Faculty of Science is thrilled to present the second in its Distinguished Scientist Lectureship Series. Dr. Philip Currie is an internationally renowned palaeontologist and has been a great influence in developing Alberta as a centre of excellence in palaeontology. He will be presenting “Hunting dinosaurs in Alberta, one of the richest dinosaur sites in the world”. All are welcome to attend this exciting presentation. Dr. Philip J. Currie is a Professor and Canada Research Chair at the University of Alberta in the Department of Biological Sciences. He is the former Curator of Dinosaurs at the Royal Tyrrell Museum of Palaeontology, and an Adjunct Professor at the University of Calgary. He got his BSc at the University of Toronto in 1972, and his MSc and PhD at McGill in 1975 and 1981, and honorary degrees from the Universities of Calgary (2008) and the University of British Columbia (2015). He is a Fellow of the Royal Society of Canada (1999) and a member of the Explorers Club (2001). Dr. Currie has published more than 225 scientific articles in peer reviewed journals, another 50 scientific papers in conference volumes and books, 158 popular articles and twenty books, focussing on the growth and variation of extinct reptiles, the anatomy and relationships of carnivorous dinosaurs, and the origin of birds. 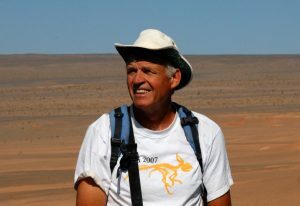 Fieldwork connected with his research has been concentrated in Alberta, Argentina, British Columbia, China, Mongolia, and the Arctic and Antarctica. The Meritorious Service Cross in 2016; the Romer-Simpson Lifetime Achievement Award of the Society of Vertebrate Paleontology in 2017. In 2015, he was deeply honoured by the opening of the Philip J. Currie Dinosaur Museum in Wembley, Alberta. Since 1986, Dr. Currie has supervised or co-supervised more than 40 MSc and PhD students at the Universities of Alberta, Calgary, Copenhagen and Saskatchewan. Currently he is supervising eight (5 MSc, 2 Phd and one postdoctoral) students at the University of Alberta. He has given hundreds of popular and scientific lectures on dinosaurs all over the world, and is often interviewed by the press. In 2012, Dr. Currie was involved in the development of University of Alberta’s first Massive Open Online Course (MOOC) called DINO 101. It had its premiere in September of 2013 and by now more than 100,000 students from all over the world have taken this course. A new mini-MOOC (Paleontology: Theropod Dinosaurs and the Origin of Birds) was released in 2016.